Speaking with Gadgets 360 during a March trip to open Apple's App Accelerator center in Bengaluru, India, Schiller was asked to comment on Amazon Echo and Google Home, both major players in bringing virtual assistant technology to the living room. Schiller declined to address any one device, saying, "My mother used to have a saying that if you don't have something nice to say, say nothing at all," but agreed to discuss the topic in abstract terms. For its part, Apple "believes deeply" in voice-driven assistants, he said. Citing ongoing development of the Siri virtual assistant as proof of Apple's dedication to the technology, Schiller also noted burgeoning interest in "voice-only" assistants that lack screens. Amazon's various Echo products and Google Home both rely solely on verbal interaction to accept commands and answer user queries. "[...] we think it's important to -- that there are times when it's convenient to simply use your voice when you are not able to use the screen," Schiller said. "For example, if you're driving [and] you want Siri to work for you without having to look at the screen, that's the best thing. Or maybe you're across the room, and you want to ask Siri to change the song you were listening to -- you don't have to walk over and back." That said, a voice assistant without a screen is limited in its utility, Schiller said. "So there's many moments where a voice assistant is really beneficial, but that doesn't mean you'd never want a screen," he said. "So the idea of not having a screen, I don't think suits many situations." In its current form, Siri is only offered on devices with built-in screens, most recently making its way to Mac last year as part of macOS Sierra. Schiller offered Maps interactions as an example scenario. When performing navigation operations, especially with Apple Watch and CarPlay, voice assistants can provide verbal directions, but the added benefit of a graphical map helps users better understand their surroundings. Interestingly, Schiller cited photography as a second scenario in which screen integration benefits the end user. "Or, for example, with photography, and one of the most popular reasons for our products is photography now, and photography requires a screen," he said. "So the idea of a device without a screen, well it's not really useful for that whole category of photos that we all share. And all the social networking apps that are now embracing photos more and more, well, it doesn't work really so great in voice-only assistants." Siri currently supports a number of photo viewing commands, including granular controls for searching by date, location and, if facial recognition is activated, people. The virtual assistant also lets users share content via share sheets. Moving further into the weeds, Schiller mentioned games as a third area of interest for voice assistants. While iOS games have yet to integrate Siri functionality, Schiller said he has "yet to see any voice-only games that, for me, are nearly as fun as the one that I play on my screen." "And so I think voice assistants are incredibly powerful, their intelligence is going to grow, they're gonna do more for us, but the role of the screen is gonna remain very important to all of this," he said. Schiller's comments, while vague, provide key insight into Apple's vision for voice assistant technology and potentially future products. The company is rumored to launch its own Siri-based Echo competitor in the near future, perhaps as soon as WWDC in June. Details of the supposed device are scarce, though reports suggest a cylindrical design with concave top inspired by the Mac Pro. KGI analyst Ming-Chi Kuo believes the Siri speaker will feature high-quality audio components, a powerful CPU equivalent to an A8 SoC or newer, AirPlay support and a custom W1 Bluetooth chip for easy pairing. Kuo made no mention of a display in his predictions. Whether Apple intends to integrate a screen in its purported Siri home speaker is unclear, though Amazon is seemingly going that route with a rumored touchscreen Echo device. "[...] but there is an interesting question about role of voice-only products in comparison to the products that have voice, and screen, and touch, and I think that's an interesting discussion about when is each appropriate, and what can they do in our lives," Schiller said. "I think that's interesting." Schiller also discusses potential changes to App Store pricing and Swift uptake in the Gadget 360 interview. In a truly connected home the microphone(s), the speaker(s), and the display(s) don't have to be on the same device. Being able to softly speak a command that will play audio or display images/video seamlessly is more important than having dedicated a smart picture frame, smart speaker, or smart TV. Well then, the answer might be to make an Echo-like device that includes a built-in smart connector for charging, and/or perhaps wireless charge capability. It would have all the directional microphones and speakers, use Bluetooth LE (W1 chip) to connect to your iPhone or iPad and use them as its screen when they are docked for charging or otherwise paired. I personally wouldn't give it a lightning connector, preferring to see it push toward a wireless docking/charging future, but it could still pair with existing iPhones and iPads for use of their screen; you'd just have to use your existing lightning charger in accompaniment with it. Well there you have it. Apple's home assistant uses a screen. Isn't this the guy Apple trots out for Comedic Relief? Yes, but also want a product that accessible to the broader market - ie not exclusively the rich. The setups yi describe exist, but take a lot of damn money. Apple will build something that sells to mass market, and can operate as a stand alone or scales based on other connected devices, etc. To be a great stand alone, you need a screen. Sounds like they are hinting at making the Apple TV into a voice driven assistant. Performing those functions while maintaining the ability to use the screen as needed. 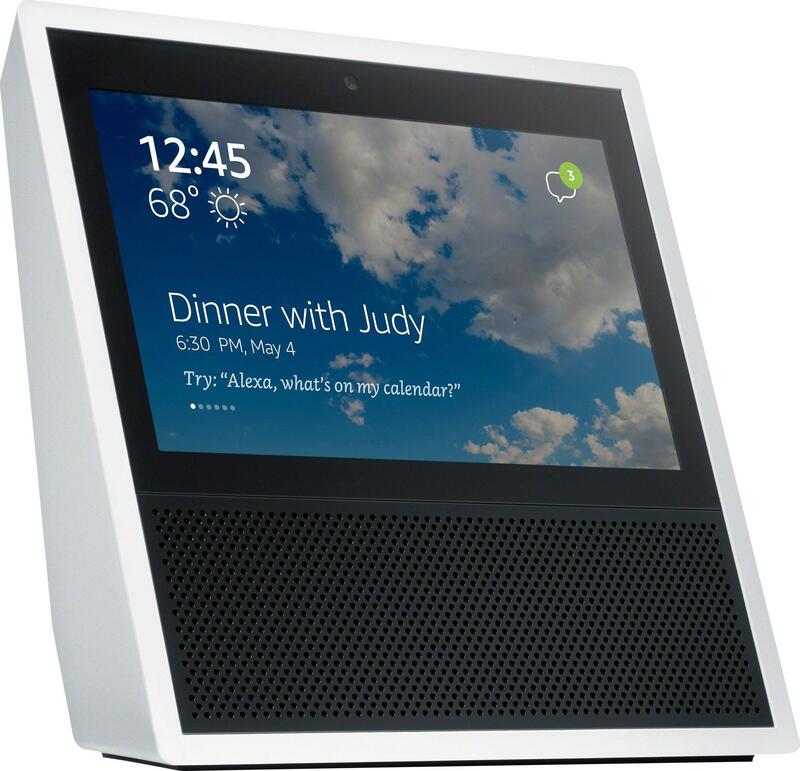 1) How are the stand-alone Echos successful without a built-in screen? 2) There's alexa.amazon.com and their Alexa apps for handhelds that allow you a lot more "screen" access than what Siri has ever offered the user. 3) Routers are stand-alone devices and they seem to do alright without a display. Why is an app or website for configuration perfectly fine for them, but not all of a sudden when you include a microphone? I use Siri so I don't have to use a screen for input and viewing basic commands? You know that adding a touchscreen display makes devices more expensive, not less? This is why being able to say to Apple Home, "Hey Siri, play Apple Music on the Apple TV" without having to use a remote control that requires me to press a button to speak a voice command would be convenient. 4) Speaking of the Siri Remote, it doesn't have a display, yet when you use Siri it sends the signal via your Apple TV which displays on a 3rd device that isn't made by Apple, so basic networking technology clearly works just fine. Can't lie if they can animate Siri like the picture above that would be bad a**. I believe a touch bar on top would be super useful, beautiful and practical. Maybe, but the Apple TV may not be ideally placed for that usage. Apple Stores sell a couple different Apple TV mounts, which I've only ever seen mounted behind a flatscreen television as it helps obfuscate wires and since it uses Bluetooth doesn't need to have line-of-sight. This could make speaking to Siri difficult, which is why there's a mic in the Siri remote. That said, microphones are inexpensive HW and Apple already has the SW so it wouldn't add any real cost to the device to make it one of many potential Siri-based digital personal assistants you can have throughout your home. Interesting timing for this article to post on the day the Amazon assistant with a screen leaked. You "get" it Soli. I've got a hunch that that's where Apple may be going with this. Most of have Siri with a screen and speakers they're called iPod Touch/iPhone/iPads. Imagine I ask for something on the Siri speaker and it displays picture and video content on my Apple TV or mobile device? It almost becomes a 2nd screen scenario that Apple abandoned where you had differing content across your iPhone and Apple TV but in sync. Leverage the screens people already have. For a 3rd-party app, Spotify has done a great job in syncing devices. I can play via my iPhone, Mac, Amazon Echo, Samsung TV, and Apple TV with ease by using a web browser and iPhone app to change the audio source with Spotify Connect, which might be a premium-only service. It was also the easiest process I've ever seen to add a new device because it knew when you accessed the app that your location had other authenticated devices on that local network (not even a one-time code to input on an access page). Maybe that's too insecure for other solutions, like iCloud as a whole, but for streaming music it's fine and I never had to give Samsung my Spotify login. You can do this with the Echo right now from an iOS or Android device after you've paired it to a device by saying "Alexa, Connect," which I use when I come back inside after driving, walking, jogging, doing yard work, whatever, and I want to continue the music, SiriusXM, podcast, audiobook, phone call, whatever to which I'm currently listening. The only drawback is that it's limited to the last device you Paired, which for me isn't an issue but that would be for other households, which is why I'd love to see user profiles established, but we don't yet have that for the Apple TV so who knows when that will happen. Could we see Touch ID and an OLED display on the Siri Remote? I thought that was Eddie Cue. Voice assistant with a screen. Hmm. Why not just rework the iPad design to be more suited to the task? Good way to boost laggin iPad sales - or at least keep the factories at capacity. The screen is important for chortling over how badly Siri botched it. O, Siri. When will you learn. If it's a big product that speaks, it's already too stationary. I think the whole concept is pretty dumb. So if the assistant is the Apple TV, you have to walk to the TV. If it's this speaker thing, you have to walk to the speaker thing. If it's a big piece with a screen, man.. that's so boring. Even if it's a smaller device, you have to walk over to that smaller device, or bring it along. In the end I'd just not bother. The obvious product would be a phone or an iPad, that could be put flat on the table and enter an intelligent always-listening mode, and track conversations around itself, detect different persons, understand who is talking to who, and display extended threads of information in realtime, as the conversation is going on, and even predict, or show threads of extended and related (and accurate) information, to enrichen the conversation. A future(istic) model could have a holographic projection swivel above it when put flat on the table, facing the one talking, but for everyone to see. Another obvious ingredient here is AR. Although it'll be limited to the one wearing the AR device, it is also something that I bet Apple is working on. So does this speaker assistant have a dock for charging your phone or iPad atop it and anything requiring a screen is put onto it and removing your device continues this behaviour with a certain distance from the speaker.